This series of stereo microscopes incorporate a zoom ratio of 1:6.7, one of the industry's largest, with a standard working distance of 113mm inside a Greenough optical stereo system. This configuration makes this an ideal system for setting up a work station for preparation, dissecting, micro-assembly, forensics or quality assurance. Moreover, the system provides a maximum magnification of 320X [with optional eyepieces] and guaranteed parfocality throughout the magnifications. The stand features a rigid-arm and wide surface stand with integral focusing block mounted on the flat laminate base. Extensible rigid arm can can be adjusted to accomodate large specimens or extended working distances. 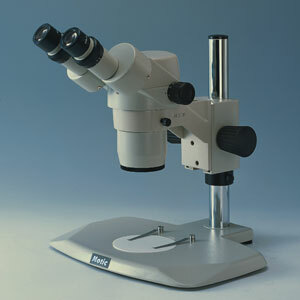 This durable, anti-fungal microscope is available in binocular and trinocular configurations.